Like troubled Job we ask, where does one find hope? Job is having a difficult time – a very difficult time. It’s good to recall the story of Job. Job had a good and prosperous life. He was a good man who loved God and lived as God deigned. One day Satan was challenging God, saying no one could live as the Lord wanted. God told Satan that Job was living a good life. Satan responded by saying that the cause of this was Job’s prosperity. He argued that if all his blessings were removed, then he would not live a good life. God allowed Satan to test Job. Satan went to work on Job. He took away his possessions, his flocks, even his family. He sent him boils on his skin. Job was alone. He was destitute. Sometimes when life throws us a curveball we might feel like Job. The levels of suffering may vary but many will share the same sense of isolation or loneliness (“no one understands what I am going through”), a sense of hopelessness (“will this never end?”) and a sense of confusion (“why is this happening to me?”). The loss one faces can be as serious as the loss of a loved one (especially a child, spouse or parent), living in poverty, being unemployed for a long period of time, or dealing with a persistent illness. It could be an anxiety disorder, a broken relationship, a sense of futility or failure. Many people facing these types of situations might readily relate to Job’s sleepless nights and the days seem to linger on without end as Job says: “If in bed I say, ‘When shall I arise?’ then the night drags on; I am filled with restlessness until dawn. My days are swifter than a weaver’s shuttle; they come to an end without hope.” So reflecting on this situation we might ask: Where does one find relief? Where does one look for deliverance? Where does one find hope? The Gospel gives us the answers. The Gospel reading picks up where last Sunday’s reading left off. We are early in the public ministry of Jesus and he is being followed by the first disciples who responded to his invitation to “Come follow me.” They continue to learn about Jesus – who he is, what he does and what he teaches. Last Sunday, we learned that people are astonished at his teaching and his authority. This Sunday we gain further insight into his mission. These insights help us to have faith – and it is our faith that will see us through the difficult times in life. The first part of today’s Gospel passage recalls the healing of Simon Peter’s mother-in-law. We are told that she is in bed with a fever. Hearing that today we might not give it much thought. But the illness is serious. Today we have the benefits of modern medicine that were unavailable in the ancient world. Fever was a serious condition, many times life threatening. The illness coming into a family would cause a great amount of anxiety and suffering; not only for the sick person but for all his or her loved ones who had to watch and wait. Such is the situation when Jesus arrives with James and John at the home of Simon and Andrew. They immediately inform Jesus of the illness. He goes to Simon’s mother-in-law, takes her hand and gently helps her up to her feet. Think about the times you’ve had a fever. Your body feels sluggish, tired, filled with aches, and many times you feel hot and are sweating. So the ill woman would have been laid down with some if not all these sensations. As soon as Jesus touches her she can rise from bed – and then she proceeds to wait on them. The healing is so complete and instantaneous that immediately she resumes her household tasks (in this case hospitality). The story tells us, as it did those early disciples, that Jesus can heal, that he does heal. He has compassion for the sick. As his reputation spreads, more and more people come to him seeking healing. St. Mark recounts this in summary fashion saying: “The whole town was gathered at the door. He cured many who were sick with various diseases, and he drove out many demons ….” Jesus helps many people especially those in most need. He is moved by their plight and he heals. Jesus also teaches. The first proclamation he made in the public ministry was: “Repent and believe in the Gospel, the Kingdom of God is at hand.” Up to this point in the Gospel we have not heard the details of this proclamation in Jesus’ words but we do see it in his life. He is the Gospel that is being proclaimed. He is the living Gospel. We see his care and concern for the needy. We see his authority as he heals the sick and exorcises demons. When he takes some time in a deserted place to pray his disciples come looking for him saying: “Everyone is looking for you.” He immediately responds: “Let us go on to the nearby villages that I may preach there also. For this purpose I have come.” He continues the proclamation of the Gospel by his presence. The point here is that Jesus is the relief for all that ails or troubles us. He is the source of relief. He is the source of hope. He is the one to deliver us. As the Gospel progresses we will soon see healings associated with faith. You may recall the story of the paralytic who wants to see Jesus. Because the crowds are so great his friends tear open the roof and lower him on a stretcher. St. Mark tells us that “When Jesus saw their faith, he said to the paralytic, ‘Child, your sins are forgiven.’” Shortly after this he says: “Rise, take up your mat and walk”(cf. 2:1-12). To the woman he cured from hemorrhages for 12 years: “Daughter, your faith has saved you” (Mark 5:34). To the blind man who asked to see, Jesus says: “Go your way; your faith has saved you” (Mark 10:52). Faith in the Gospel entails faith in Christ Jesus. Jesus heals. The healings may come in terms of physical healing but more often it is a healing deeper than the physical. Faith in Jesus may not always eliminate the things that weigh us down but it always provides us with a way to get through them. All people face suffering in life. It may not be as extreme as Job’s but it is real nonetheless. The suffering calls for healing. Jesus provides that healing through faith. The things that trouble us may still persist but they are robbed of power. Jesus is the one who leads us through that long, dark night of Job to a morning of light and hope. 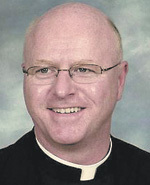 Thank you Fr Prior. At my parish the first reading wasn’t even mentioned in the homily. I am glad you shed some light on it.